" Inspiration for this event came from my 4-yr old daughter. Being a huge Frozen fan, she was in love with snow princesses! She dreamed of meeting a real snow princess someday. " 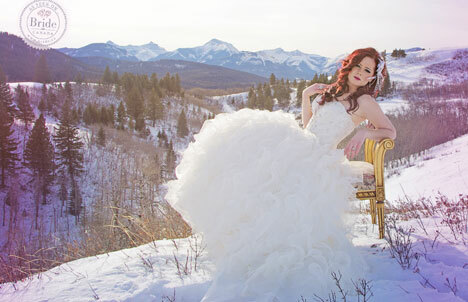 Styling, production, photography and narration by Jenny Vandersteen, Mill Canyon Photography - Pincher Creek, AB. At the same time I always hated winter, but thought that the winter offered some of the most beautiful photo opps, and infrequently saw many winter weddings. Doing summer weddings year after year, I wanted to create something different. I chose the model because I loved her look- both beautiful classically, as well as a bit edgy, with the brown/purple/red hair. 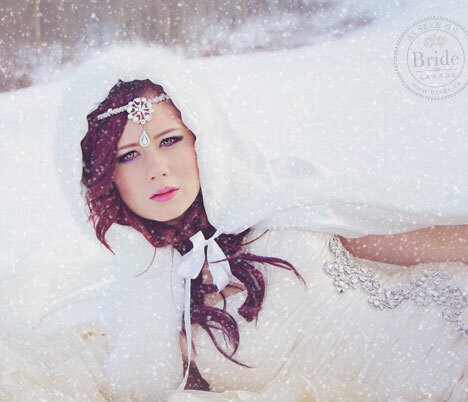 I loved the contrast created with her hair and the snow, along with her gorgeous eyes, I thought she would make the perfect winter bride. What a trooper! 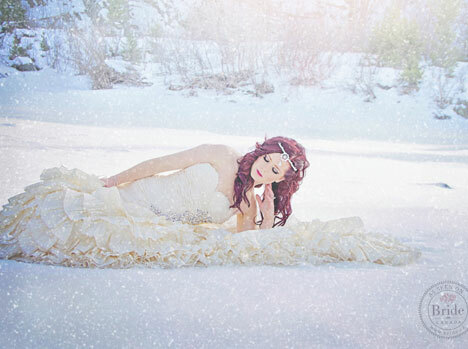 Kassidy Czerniak poised & gorgeous in the sub-zero Alberta winter conditions! Living in the heart of the southwest Alberta Rockies, winter is a big part of our year. 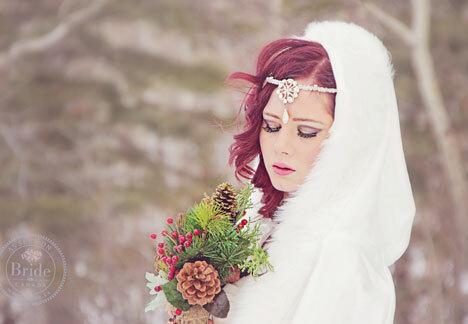 I wanted to create a beautiful inspiration to brides to consider the majesty and uniqueness of winter weddings. I started gathering ideas of inspiration for this shoot, selected my ideal model, designed the headpieces & bouquets, found the perfect gown, and the best hair & make-up artist. Everyone involved was from the local area, which I loved as well! The beautiful Pnina Tournai gown was actually lent to the shoot by one Jenny's friends. They are unfortunately no tfor sale in Canada! 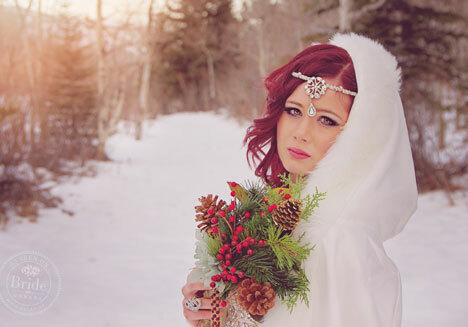 The day of the shoot was about minus 18 degrees and windy... the usual Albertan winter weather! Cool and windy, chilling to the bone! 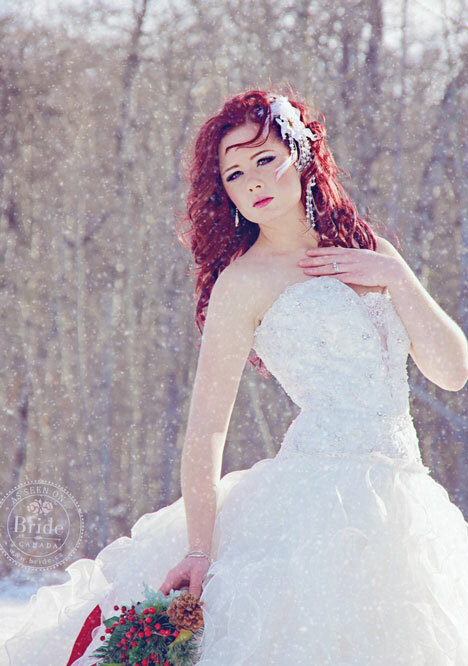 The model, Kassidy, just dressed in boots and wedding gown, she was amazing working in such conditions. We had to bring a truck and move in and out of the vehicle, trying to stay warm. Her hands were very red during the shoot, but she remained beautiful and composed. Even laying in the snow just to create the perfect shot. People drove by on the road, thinking we were crazy to be out in that weather taking photos! But, once they saw some of the shots, they understood why! The crazy things models and photographers do for beautiful images! This is our favourite photograph from the whole shoot. Beautiful and haunting, Frozen! but also Snowwhite & the Huntsman as well .. WELL DONE!
" And the best part: my daughter (4yrs) - and son! (2yrs) - got their chance to meet a real snow princess! "